Welcome to our Autumn Update: as ever there’s a lot to catch up on – reshuffles, debates, demos and trials – and lots for us to do. We’re particularly excited about our upcoming protest, but before we start a quick reminder: it only takes a minute to join or donate to Abortion Rights. Your support will really make a difference to our campaign. Two members of extreme anti-choice group Abort67 have been found not guilty of public order offences at a court in Brighton. The Abort67 activists, Andrew Stephenson and Kathryn Sloane, showed images of late-term abortions outside the Wistons clinic in Brighton, and refused to remove the pictures when asked to do so by police, who then brought a prosecution under the Public Order Act. 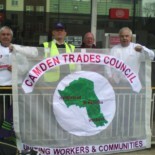 This entry was posted on September 20, 2012 by CAMDEN TRADES COUNCIL.